The Massey Medals for Architecture program was established in 1950 to promote and recognize excellence in Canadian architecture, and to increase public awareness of architecture as an expression of Canadian cultural life. Initiated by Vincent Massey, scion of one of Canada’s most distinguished and wealthy families and the Governor General of Canada from 1952 to 1959, the Massey competitions were held every three years from 1952 through 1970 in association with the Royal Architectural Institute of Canada. Juries included Canadian and international luminaries such as Pietro Belluschi, William Wurster, Sir Hugh Casson, Eric Arthur and Peter Blake. The format of the Massey Medals evolved over the years, with varying categories and numbers of medals awarded. The Gold Medal was initially the highest accolade, representing “the most significant contribution to Canadian architecture in the three-year period prior to the award.” A Silver Medal was presented to the winner of each building type category, and other entrants deemed to be of merit earned mention as finalists. Building type categories were eliminated following the 1958 competition, and after 1961 the Gold Medal was dropped and all medals were awarded on equal standing. The inaugural Massey Medals for Architecture competition, held in 1950, was somewhat of a false start. Only 22 architects participated, no awards were made in several categories, and a single firm, Toronto’s John B. Parkin Associates, received five of the nine medals awarded, including the overall Gold Medal. In 1952, though, the program began to flourish: the number of submissions increased dramatically and the Gold Medal winner, the Marwell Building by the Vancouver firm Semmens & Simpson, was unanimously praised as an exceptional example of Canadian architecture. Four of the eight Silver Medals were awarded to other British Columbia entries, acknowledging the emergence of the province (and particularly Vancouver) as a centre of creative and dynamic architecture. Subsequent Massey competitions were ever more popular, peaking in 1964 and 1967 with 424 entries each. While British Columbia architects consistently earned accolades for single-family residences, Toronto firms received awards primarily for corporate and institutional buildings and multi-unit housing. Toronto-area medal winners regarded as enduring landmarks in Canadian architecture include the Ontario Association of Architects building and the Ortho Pharmaceutical offices and plant by John B. Parkin Associates; the Garden Court Apartments and the Regent Park South high-rise towers by Page & Steele; Central Technical School Art Centre by Fairfield & DuBois; and Scarborough College by John Andrews Architect (with Page & Steele), one of the few Canadian buildings of the era to gain international renown. Despite the Massey program’s apparent success, criticism was growing over what was increasingly perceived as arbitrary and uninspired medal selections. This discontent culminated in outrage at the results of the 1970 competition. The managing editor of The Canadian Architect wrote a scathing four-page editorial arguing that while some of the medals were well-deserved, the seemingly inexplicable rejection of several extremely accomplished buildings had greatly diminished the program’s esteem and value, and that the lost credibility could only be restored by fundamental changes to the awards criteria and judging process. The magazine even included a tear-out page for readers to forward their presumably indignant comments to the Massey organizers. This backlash seemed to kill any remaining enthusiasm for the program; 1970 became the final edition of the Massey Medals for Architecture. 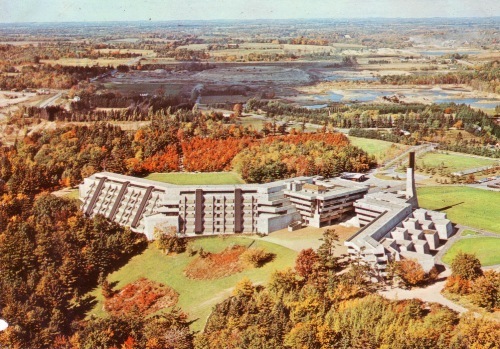 It was eventually superseded in 1982 by the Governor-General’s Awards for Architecture, which continues today as Canada’s principal architectural awards program. Listed below are the Massey Medal recipients in the Toronto area. Unfortunately, despite their award-winning status, several have been demolished and many others extensively altered. Building names are as they were at the time of the award; addresses are current. No medals were awarded to Toronto-area entries. You have so much wonderful info on your site – what a super exploration of modernism in Toronto. Gives me lots of ideas of places to explore. Thanks – glad you enjoy the blog! My dad loves both architecture and cycling. For his birthday, I’m creating a Toronto architecture cycling tour booklet. Your blog has really helped me find some cool buildings to put in it. Thanks!